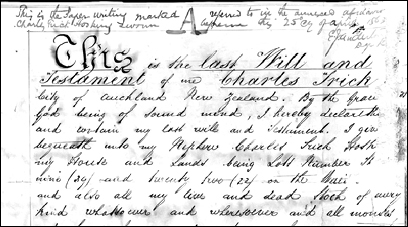 On the 20th day of July in the year 1861, a New Zealander by the name of Charles Trick executed his last will and testament. In many ways, there’s really nothing unusual about the document. It’s got the usual two witnesses: Carpenter Arthur and John G. Arthur, both of Pit Street in Auckland. It’s got the usual bequests, to a whole bunch of nephews and 10 pounds to his mother. And it’s got the key bequest — the bulk of the estate was to one particular nephew who lived there in Auckland and who, it appears, was named for his uncle: Charles Trick Hosking, who was also named as executor. It seemed for a while like the only thing that was a bit unusual was a codicil to the will, added on the 23rd of August 1862: it added another 50 pounds to the 50 pounds already being left to one of the nephews, Richard Cory Hosking, brother of the executor and main heir. And otherwise it was all pretty routine. Except, while reading through the will, The Legal Genealogist came smack dab up against a total “huh?” moment. Because there is a term in the will that, I confess, I hadn’t come across before. I confess to all kinds of mental images of dead animals littering up a farm pasture. Fortunately, the reality is much more prosaic. Nope. This one has to be looked up in the plain ordinary every day dictionaries. Where, it turns out, it has a plain ordinary every day meaning. In other words, a farmer’s stock in trade that isn’t bleating, mooing, cackling, baaing or neighing, to be precise. You left out oinking and braying. Sigh… what can I say? I’m a suburban kid. Hmmm, maybe I’ll add a codicil to my will leaving the dead stock to my older son. Now that should liven things up a bit in the probate judge’s office. Feeling mischievous…. Yes I had similar in a family will of about 200 years ago.